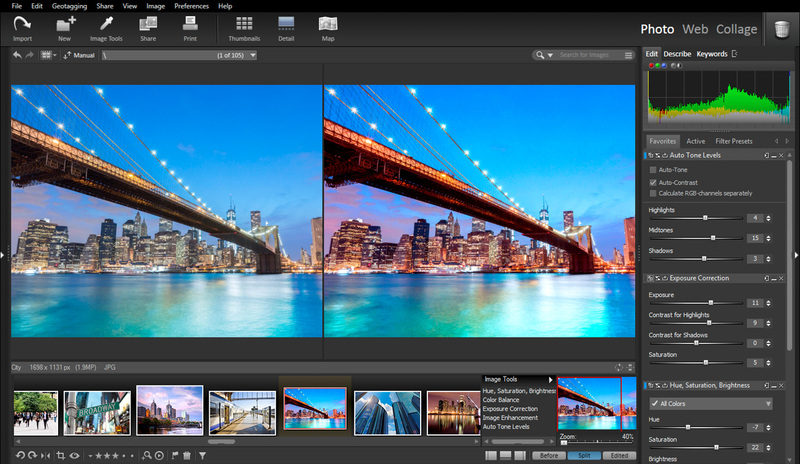 StudioLine Photo Pro 4 is a sophisticated, multi-user image management and archival solution, with integrated image tools and filters, designed for server-based networks. User profiles control access to individual folders and functions. Detailed permissions allow tailoring each user?s abilities based on the responsibilities assigned to them, such as assigning keywords or exporting images. The load assistant guides you through loading photos from camera (including Canon cameras), hard disk or other media. Categorize your images with unlimited amounts of text in various system and user descriptor fields, or use the mouse to drag keywords to images. The auto-complete option will suggest previously used values to eliminate mistakes and aid with consistency. StudioLine Photo Pro 4 can automatically retrieve GPS information from data loggers to populate the photos? location data. There is also a manual geotagging feature to pinpoint image locations directly on a map. The ergonomical search in the menu bar is always ready to quickly find images by any criteria. Advanced searches that look up information in any combination of fields are also available. For optimal composition, a crop, rotate and alignment tool includes grids based on squares, rules of thirds and the golden ratio. Image proportions can be preserved. A mouse click can adopt identical image editing steps and settings, as well descriptions and other metadata, to any number of similar images. Original images are always maintained unchanged, so that edits can be rolled back, even individually, at any time. Personalize watermarks by combining graphics with text, and rotate, align or tile as needed ? then apply to exported or shared images, which will discourage unauthorized use.